CES 2015: Audio-Technica launches high-res portable headphone amplifier | What Hi-Fi? 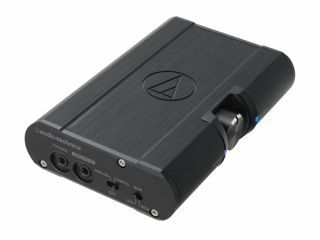 Audio-Technica has unveiled a high-resolution portable headphone amp, the AT-PHA100. It can decode high-res files in DSD 32-bit/128khz, and PCM 32-bit/384kHz. The amp is equipped with a 3.5mm jack and micro USB socket. There is also a high/low gain switch, a machined aluminium volume dial, and a five-stage sampling indicator (for digital input). An internal rechargeable lithium polymer battery lasts up to 14 hours with analogue signals, or six hours on digital ones. All of this is housed in an all-aluminium enclosure measuring 27x77x116mm. The total weight is 240g. The AT-PHA100 is due for release in April, and will cost £490. This week also sees the release of the Audio-Technica ATH-MSR7 headphones, designed to make the most of high-res audio.